The Rochester Area Family YMCA will be holding two wrestling clinics on August 12th (K-6th) and August 13th (7-12). Clinic and registration information can be found here. A reminder that the youth 5002 Club starts on Monday. Download the 2014 5002 Club details and calendar here. The first year of the program started with 11 wrestlers completing the challenge, 13 the second year, and 15 last year. Let’s see if we can get 17 wrestlers doing the workouts this year! Several ZM youth and high school wrestlers are attending Inner Drive wrestling in Rochester. Golden Gopher David Thorn (back row in blue shirt) led an outstanding practice on Wednesday. 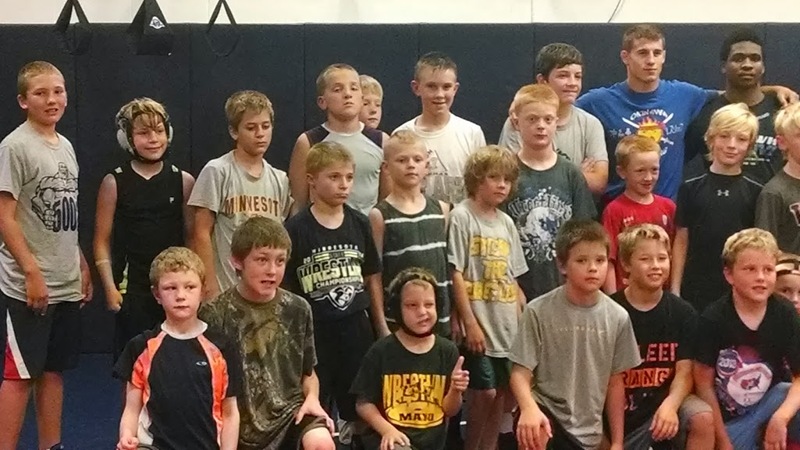 Three ZM youth wrestlers are also pictured below. See if you can find them. No plans this Saturday? There is a PreK through 6th Grade Takedown Tournament in Watertown.